(3) The dam of the foal will be bred back in 2019 to a stallion standing in Pennsylvania which is registered with the Pennsylvania Horse Breeders Association as a Pennsylvania stallion, and reside in the state for at least sixty (60) consecutive days during which foaling occurred. 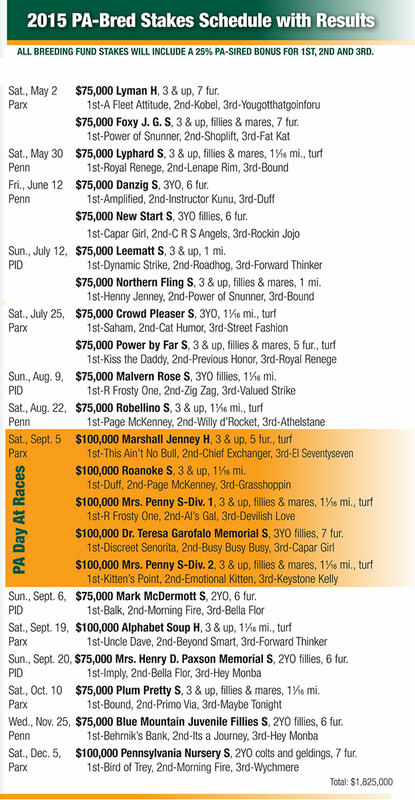 Check the choice above under which the foal of the subject broodmare will qualify. (999) 555-1212 10 digit phone number with area code. I, the undersigned broodmare owner, certify all information provided in order for this foaling broodmare to be eligible for participation in the Pennsylvania Breeding Fund program. I assume full responsibility for all information regarding this broodmare, and agree that if the broodmare is determined to be ineligible based upon inaccurate, false, or fraudulent information: (1) the foal may be ineligible for registration as a Pennsylvania-Bred; (2) I may be forever denied the privilege of registering PA-Breds; (3) I may be forever denied the benefit of any and all breeder awards; and (4) any awards paid based upon the performance of an ineligible foal shall be returned in full by the recipient to the Pennsylvania Breeding Fund. Furthermore, I agree to promptly provide any additional information requested by the official registrar, PA Horse Breeders Association, to confirm information submitted with this broodmare domicile form. I understand that the statements herein are made subject to the penalties of 18 PA C. S. 4904 (relating to unsworn falsification to authorities).